This San Francisco sightseeing tour aims to provide an enthusiastic and authentic way to get-to-know San Francisco. Hitch a ride for an experience that mixes both our love for modern day living and our memories of San Francisco in days gone by. Our 1970’s Volkswagen Buses, complete with neon blue seats, beaded curtains and shag carpets, foster a Hippie vibe that celebrates Peace Love Freedom & Adventure. You will see breath-taking marvels such as the Golden Gate Bridge, Lombard Street, China Town, The Castro and so much more. Travel down unique streets where other buses are forbidden. 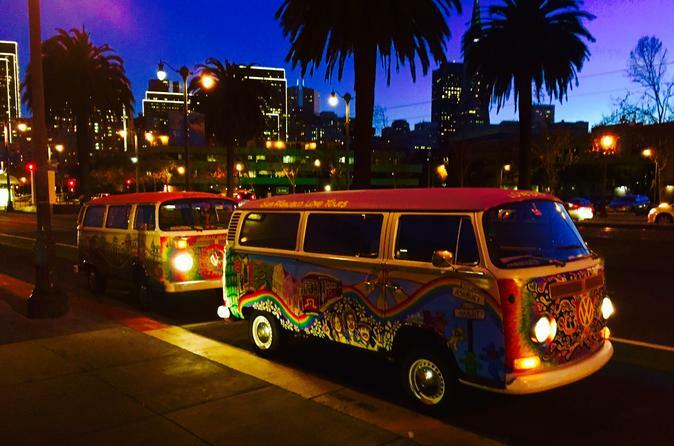 Visit the homes of San Francisco’s counter-culture icons such as The Grateful Dead, Janis Joplin, Jimi Hendrix, while grooving to the sounds of the 60’s and other San Francisco classics. In our little 6-passenger vehicle, we pack tons of historic facts, interesting stories and good old fun! We also have some stops for amazing pictures opportunities to forever capture your adventure in San Francisco. Reserve your tour today! Visit: China Town, Little Italy, Castro District, Mission District, Down Town, & Treasure Island! Fully narrated tour with fun & fact-based story telling guides!